Run of river hydroelectric projects operate without dams or other obstructions to the flow of the river. For this reason they are less disruptive to the natural state of a river. Some systems may have a small pond or partial dam at the inlet, but strictly speaking a run-or-river leaves the river intact. diagram credit: Plutonic Power Corp.
As the diagram above shows, the operators of a run of river plan divert water upstream, usually through a pipe. Downstream the water passes through a turbine to generate power before it reenters the stream. 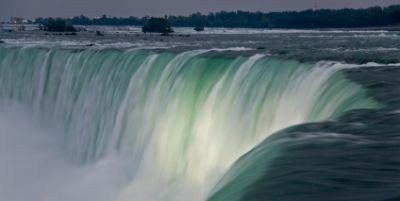 The same two factors, head and flow, determine the power output of any hydroelectric project. They apply here as well. That is, the potential for power output depends on how much water is flowing through the turbines and how far it is dropping. With a dam, the reservoir behind it serves as a store of water. The dam operators can release this water to continue generating electricity even during dry spells. Dams, however, are pretty disruptive to the natural state of the river. The Hoover Dam is an engineering wonder, but it certainly affected the river and the land upsteam. 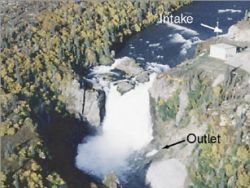 The environmental affects of dams can be minimized with proper planning and design, but the affects will always be greater than if the flow of the river is left intact. As you can see in the photo above, a run of river system has minimal impact on a river and the surrounding land. Since run-of-river systems don’t have a dam to store water they are much more vulnerable to variations in river flow. Rivers that go dry obviously can’t produce power at those times. An ideal river for this type of power production has reliable, steady flow. Although this is a limitation, many rivers do meet the requirement. On the positive side, run of river systems are adaptable to a number of situations because of their flexibility and the fact they have minimal impact on the natural characteristics of a river. The systems don’t interfere with navigation or fish migration. Water levels or the river change as they normally would. There is minimal disruption of the land surrounding the river. Because there’s no huge investment in building a dam to recover, smaller run of river systems often make economic sense. This is more true than ever giver the rising oil prices and environmental concerns of today.